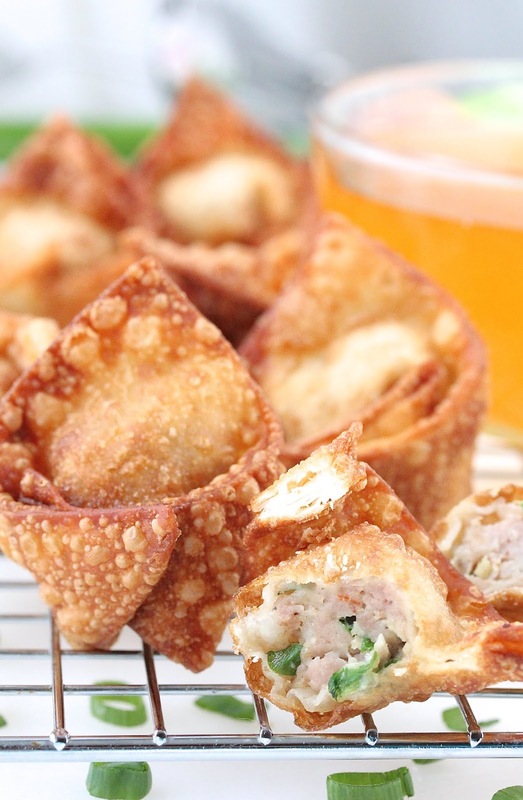 Crispy fried wontons with tender pork and shrimp filling are irresistible and addicting. They always disappear quickly! My mom makes that best egg rolls. Whenever I make egg rolls or fried wontons, I utilize two of her tricks. The first is to use both ground pork and chopped shrimp in the filling. The shrimp adds suppleness and more interesting flavor profile. The second is to add a pinch of sugar. Mom always adds it whenever she uses ground pork. The sugar somehow enhances the flavor of the meat. I'm not the one to fix what ain't broken, especially when it's mom approved. So, I just do it! The filling is composed of ground pork and finely chopped shrimp that is infused with flavors of sesame oil, soy sauce, garlic, and ginger. Hello Flavortown!! Seriously, the last four of the aforementioned ingredients is the basis for all things delicious. Right? 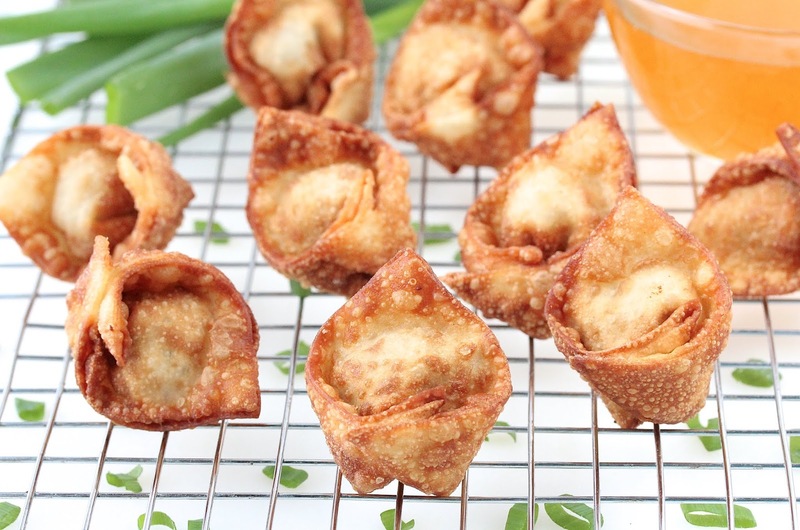 These fried wontons are so good that they do not need anything else. I love to go to town on these straight form the frying pan 'cause that's when fried food is at its best! If you must have sauce, use any of your favorites. Duck sauce, sweet chili sauce, honey-sesame, soy ginger all would be perfect! If you think you should make these, I'm here to tell you to stop thinking and start doing! 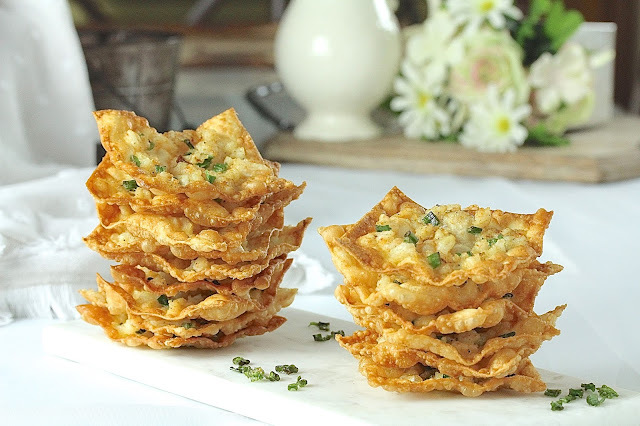 :) These crispy and delicious morsels are not to be missed!! You are going to be glad that you listened! Add the first ten ingredients into a medium mixing bowl. Add 1/2 of the beaten egg (eyeballing it is fine). Using hands, combine all of the ingredients. Fill a frying pan 1/2 way up with cooking oil. 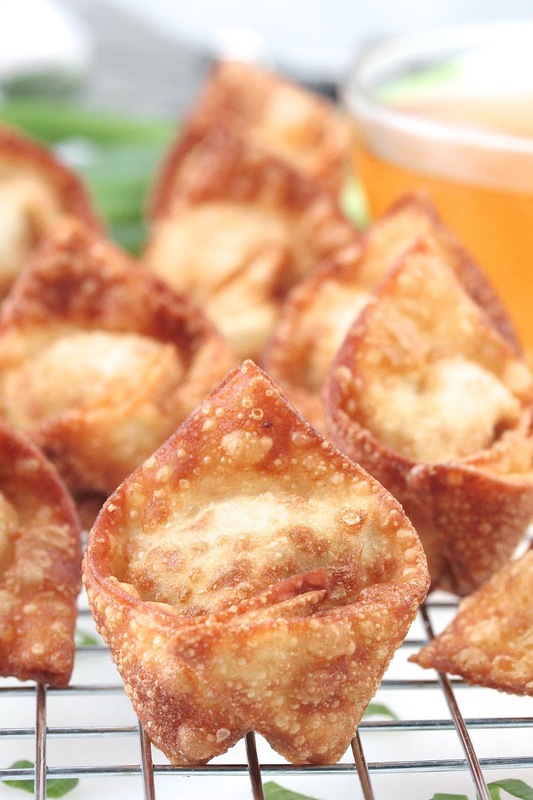 Preheat on to 360 degrees F.
Whisk 1 1/2 teaspoon water into the unused portion of the beaten egg to make an egg wash.
Add 1 1/2 measured teaspoon of the filling to the center of a wonton wrap. 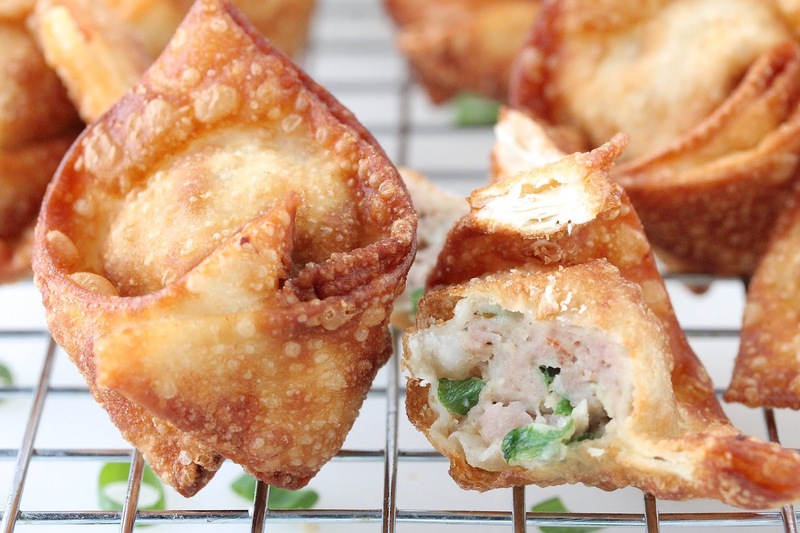 Using a finger, moisten two adjacent edges of the wonton wrap with the egg wash. Fold the moisten edges over to the opposite side, lining up with the dry edges to form a triangle. Press edges to seal tightly. Next, brush one of the corners at the base (the longest side) of the triangle with the egg wash. Bring the two corners together towards the center. Crisscross at the center, pressing the wet corner to the dry corner to seal. Repeat filling and sealing wontons. Cooking in batches, add wontons to the hot oil, leaving plenty of room between each. Fry for a total of 2 to 3 minutes, until the wontons are crispy and golden brown. Use a slotted spoon to transfer to a wire rack or paper towels. 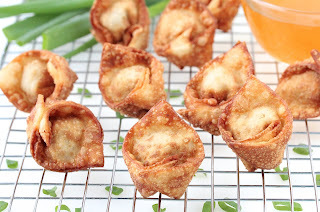 Continue frying the remaining wontons. Left overs are best stored frozen and reheated in an oven. Makes 42 - 48 wontons.